The Cernunnos of the Pillar of the Boatmen. Cernunnos is the name of a pre-Christian Celtic deity. The name is conventionally assigned to male god figures in Celtic art that wear antlers and torcs. The antlered figure of the Gundestrup cauldron. The word Cernunnos is found in that form on exactly one contemporary inscription, the Pillar of the Boatmen , which in the first century CE embellished a temple in what is now Paris, in the Roman territory of Gaul. The Cernunnos of that figure wears short antlers decorated by torcs. The pillar is an artifact of the Gallo-Roman religion ; it depicts Roman gods like Jupiter, Vulcan, and Castor and Pollux, along with more well known Gaulish deities such as Esus , Smertrios , and Tarvos Trigaranus . There is an inscription "Deo Cernunnos", which would be the dative form of "Cernunnos" (thus "to the god Cernunnos")from Polenza, Italy; this inscription, however, may be a hoax. A similar word (καρνονου, karnonū, dative case) is found in a Celtic inscription in Greek characters in the south of France; which likely refers to the same being. Two Gaulish inscriptions from Luxembourg name a Cerunincos, which is likely a related name. This is the extent of the evidence that Cernunnos was the name of a deity. The word would appear to mean "the one with antlers", and ultimately derives from the Indo-European root *k̑r̥no-, "horn"; the English word itself is a cognate. A number of horned or antlered figures appear in Celtic art; a celebrated example is on the Gundestrup cauldron from Denmark. There is no evidence that this deity was named Cernunnos, or that the name was used outside of Gaul. None of the Roman or Irish accounts of ancient Celtic religion mention either the name Cernunnos, nor a horned or antlered figure; there are, however, several representations which combine Cernunnos imagery with that of Mercury. No myths, legends, or other stories have been preserved in which either Cernunnos under that name, nor any other figure described as having antlers, participates in any way. The name also may be related to the hero Conall Cernach from the Old Irish Ulster cycle of tales; This identification, however, is disputed by others. The general use of 'Cernunnos' as the name of a horned deity also omits mention of the fact that other names for horned deities are attested; the gods Belatucadros , the 'bright shining one', attested in Cumberland and Westmoreland, and Antenociticus , from near Newcastle, are two examples of horned and torc-wearing deities from Britain alone. Had we not known of these local names, they too likely would have become examples of 'Cernunnos'. 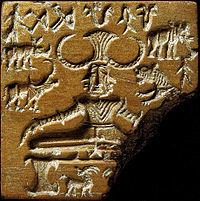 A seal from Mohenjo-daro, thought by some to represent Shiva, and also claimed as a representation of Cernunnos. The scant attestation of the name Cernunnos has not prevented a great deal of speculation from moderns who find the idea of such a deity fetching. Cernunnos has been linked with Shiva Pashupati (Sanskrit: पशुपतिनाथ), Shiva in his aspect as lord of the animals; there is no actual evidence other than the presence of animals, and the allegedly yogic posture of the figure of the Gundestrup cauldron that links the Celtic and Hindu deities. On even scantier evidence, Cernunnos has been identified as the "Horned God" or "Devil" worshipped by Margaret Murray's pseudohistorical witchcraft cult, and as such became the male deity worshiped alongside the Goddess in most forms of Wicca. Murray also identifies Cernunnos with Herne the Hunter , the malignant ghost of a suicidal hunter mentioned in Shakespeare's The Merry Wives of Windsor. Herne, endowed with "great ragged horns", curses cattle and makes unpleasant noises in the manner of a poltergeist. The Gardnerian tradition of Wicca sometimes uses Cernunnos as the name of this deity. Ceisiwr Serith, Cernunnos: Looking Every Which Way. ↑ Ronald Hutton notes that heroes "who appear to be human, such as Medb or St. Brighid , probably were indeed once regarded as divine... the warriors who are the main protagonists of the stories have the same status as those in the Greek myths, standing between the human and divine orders. To regard characters such as Cú Chulainn , Fergus Mac Roich or Conall Cernach as former gods turned into humans by a later storyteller is to misunderstand their literary and religious function... Cú Chulainn is no more a former god than Superman is." Hutton, Ronald (1991). The Pagan Religions of the Ancient British Isles: Their Nature and Legacy. Oxford, UK and Cambridge, USA: Blackwell. pp. 175–176. -- Act 4, scene 4. This page was last modified on 6 April 2019, at 01:11.